Western blot analysis of extracts from Jurkat, NIH/3T3, ZR-75, MCF-7 and COS cells using Cool1/βPix Antibody. 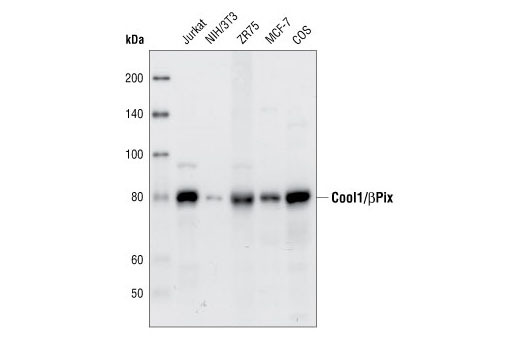 Cool1/βPix Antibody detects endogenous levels of total cool1/βPix protein. The antibody does not cross-react with cool2/αPix. Polyclonal antibodies are produced by immunizing animals with a synthetic peptide corresponding to residues in the center of human cool1/βPix. Antibodies are purified by peptide affinity chromatography. Cool/Pix proteins comprise a family of guanine nucleotide exchange factors (GEFs) localized to focal adhesions. The family consists of two isoforms, cool2/αpix and cool1/βPix, the latter having two splice variants that vary in their carboxy termini (1). Cool1/βPix, like other GEFs, has a DH (Dbl homology) domain, which allows binding of small GTPases and GDP/GTP exchange, and a PH (Pleckstrin homology) domain, which is important in regulating subcellular localization. Cool1/βPix also has an SH3 domain, which binds to the PAK kinase, a downstream effector of cdc42 and Rac (3,4). Phosphorylation of cool1/βPix by PAK2 downstream of MAPK signaling alters the localization of a complex containing PAK2 and cool-1/βPix, regulating formation of growth cones in response to growth factors (4). Growth factor induced activation of Rac1 via cool1/βPix was later shown to occur independently of subcellular localization (5). Endothelin-1 stimulation of mesangial cells stimulates the protein kinase A (PKA) pathway, resulting in translocation of cool-1/βPix and activation of cdc42 (6). Koh, C.G. et al. (2001) J Cell Sci 114, 4239-51. Manser, E. et al. (1998) Mol. Cell 1, 183-192. Bagrodia, S. and Cerione, R.A. (1999) Trends Cell Biol. 9, 350-355. Shin, E.Y. et al. (2002) J. Biol. Chem. 277, 44417-44430. Shin, E.Y. et al. (2004) J. Biol. Chem. 279, 1994-2004. Chahdi, A. et al. (2005) J. Biol. Chem. 280, 578-584.